Explanation: Sweeping slowly through northern skies, the comet PanSTARRS C/2012 K1 posed for this telescopic portrait on June 2nd in the constellation Ursa Major. Now in the inner solar system, the icy body from the Oort cloud sports two tails, a lighter broad dust tail and crooked ion tail extending below and right. The comet's condensed greenish coma makes a nice contrast with the spiky yellowish background star above. NGC 3319 appears at the upper left of the frame that spans almost twice the apparent diameter of the full Moon. The spiral galaxy is about 47 million light-years away, far beyond the stars in our own Milky Way. In comparison, the comet was a mere 14 light-minutes from our fair planet. 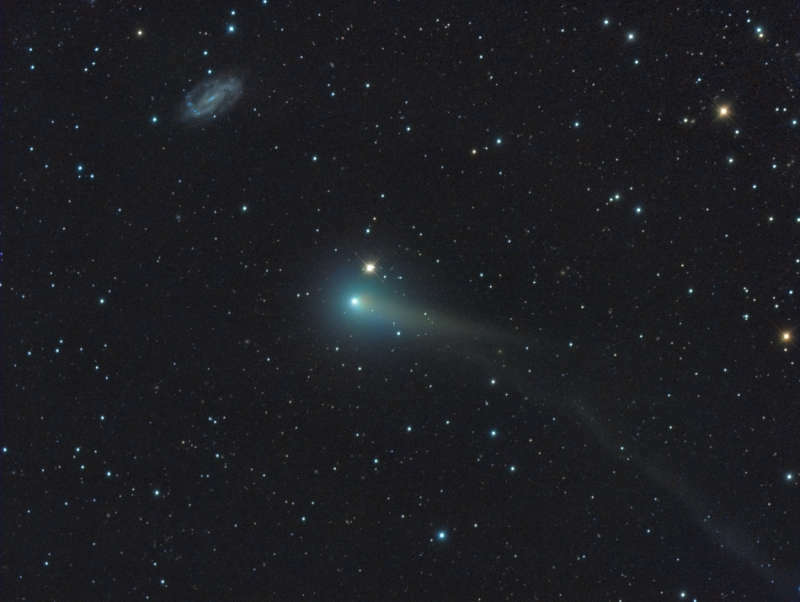 This comet PanSTARRS will slowly grow brighter in the coming months remaining a good target for telescopic comet watchers and reaching perihelion, its closest approach to the Sun, while just beyond Earth's orbit in late August.